Get your daily scoop of what State of the Union is watching today, October 18, 2013. 1) Trouble for McConnell? A major conservative super PAC is endorsing Senate Republican Leader Mitch McConnell's Tea Party primary challenger. The endorsement comes on the heels of a deal McConnell brokered to end the partial government shutdown. "Matt Bevin is a true conservative who will fight to stop the massive spending, bailouts, and debt that are destroying our country," said Senate Conservatives Fund Executive Director Matt Hoskins in a statement announcing the endorsement. "We know that winning this primary won't be easy. 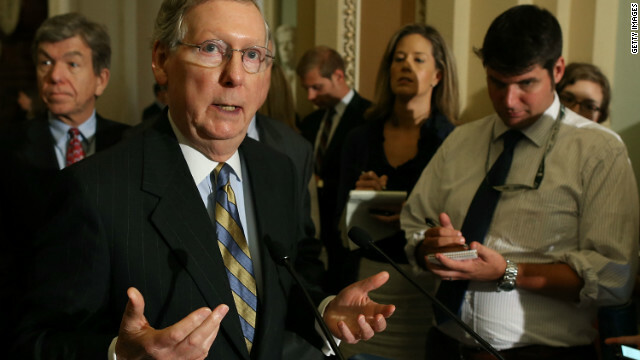 Mitch McConnell has the support of the entire Washington establishment and he will do anything to hold on to power." 2) Fix the Obamacare website, stat! 18 days after the rollout of the government's website for enrolling in health care exchanges, Healthcare.gov is still plagued by glitches. People have had trouble logging on to the site since it was launched on October 1. Republicans point to the website's rocky start as evidence of broader problems with the health care law and will hold congressional hearings next week on the website's failures. 3) Sebelius on the hot seat. The Republican National Committee is demanding that President Obama fire Health and Human Services Secretary Kathleen Sebelius for her oversight of the Affordable Care Act. "HHS Secretary Sebelius ignored red flags and repeated warnings that ObamaCare wasn't ready for primetime. She needs to be held accountable for this rollout malpractice," the RNC said on petition on its website. 4) Cruz: "I would do anything." Sen. Ted Cruz declined to rule out another government shutdown as part of his fight against the health care law. "I would do anything, and will continue to do anything I can to stop the trainwreck that is Obamacare," Cruz told ABC News. Programming note: State of the Union has an exclusive interview with Sen. Ted Cruz on Sunday. 5) Obama's new Cabinet pick. President Obama has tapped Jeh Johnson to be the nation's next Homeland Security Secretary. Johnson is former Pentagon general counsel, who helped oversee the military's drone program and the end of its "don't ask, don't tell" policy. If confirmed by the Senate, Johnson will succeed Janet Napolitano, who stepped down last summer to become president of the University of California system.